Last Sunday was the photographic industry’s big annual awards – The Master Photography Awards. Hundreds of us descended to the Hilton Metropole at the NEC in Birmingham to celebrate another year of professional photography. Out of over 5000 entries submitted to the awards, I am thrilled to report that I won two of the categories outright – namely the UK Contemporary Portrait Photographer of the Year award and the UK Pictorial, Illustrative and Fine Art Photographer of the Year Award. I won both categories with the above photograph. As with every year, the competition was extremely tough, so to win two categories was a massive thrill! 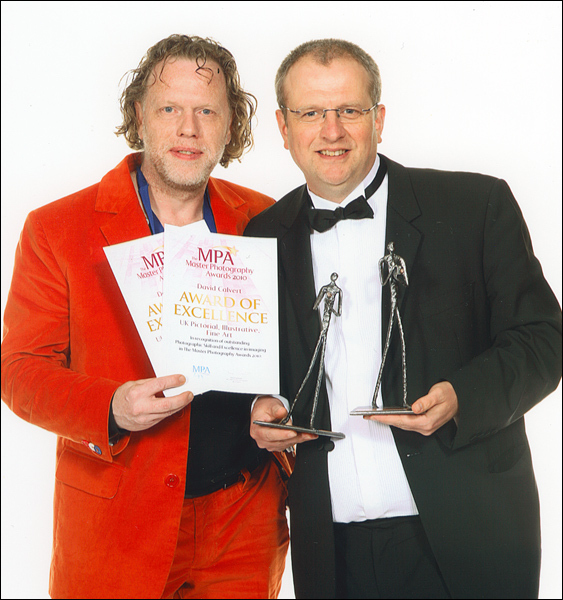 Shown below is me being presented with my awards by one of the worlds innovative portrait photographers – and President of the Master Photographers Association, Henk Van Kooten. You can see a short video clip of the awards here. Look carefully and you might just spot me! Main Photograph: © Copyright David Calvert 2010. Copying forbidden by law.